Polypropylene Packaging Tapes There are 4 products. Every professional packaging department needs a good supply of packaging tapes! We supply ranges for carton sealing, labelling packages as ‘fragile’, or cutting down the noise in the packaging area. 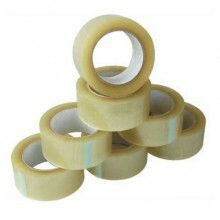 We’ve got clear tape and brown tape, and multi-coloured hot melt adhesive tape. If you need tape gun dispensers we have those too. Our polypropylene packaging tapes come in a range of sizes and colours, all designed to provide a professional and effective seal at an economical price. 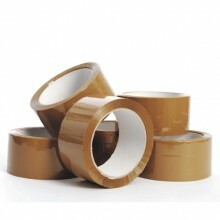 For great value, consider our economy polypropylene packaging tape which comes in clear or brown. If you’re packing in high volumes or need to work more quickly and efficiently these rolls can be used with taping machines (available separately) but they’re also perfect for taping by hand. They provide strength and resilience and are highly versatile, so worth stocking up on. Quantities of 36 or 72 are available to order. 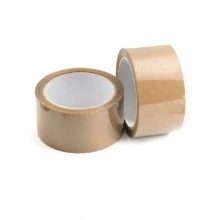 We also supply low noise tape, which is perfect for busy packaging areas where the noise of taping and sealing can get unbearable after a while. It’s almost silent to use, which is a big improvement on the loud screeching that can occur with some tapes. Our hot melt adhesive tapes are available in a range of popular colour choices, so that you can colour code your contents for quick identification. These can also be used with or without a tape dispenser. Order in higher volumes for bigger discounts and ensure your packaging area is never running low of polypropylene packing tapes. We’re here to keep you supplied so when you’re looking for packaging tapes we hope you’ll stick with us! 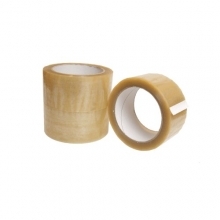 Available in clear or brown this low noise packing tape is a general purpose box sealing tape which is consistent and offers a reliable performance in a wide range of environments with less noise than other packaging tapes. Read the full product description. Available to purchase in two popular sizes 25mm x 66m & 48mm x 66m. 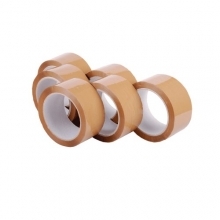 This strong premium clear packaging tape is suitable for carton sealing and general packaging / warehouse needs. The hot melt adhesive is a resilient and durable adhesive and works well on most products and in most environments above five centigrade. Read the full product description.